"Envatech" Honeycomb Panel result in lightweight, high strength unit that are very rigid. The high-strength and abrasion-resistant features offer durability attributable to its high structural integrity which can resist impact and abuse when used as partition. 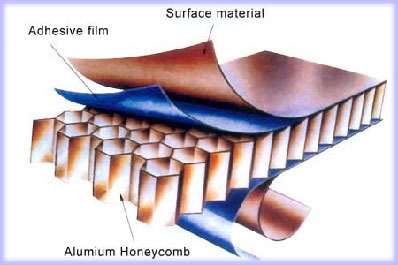 The Honeycomb Core material is stretched or preformed into a Hexagonal structure to which are bonded facing skins to form the sandwich panel. Finishes use for Honeycomb Panel are typically Aluminiun Sheet, Pre-Coated Steel Sheet, AluZinc Sheet, Plywood, PVC and Stainless Steel Sheet. Pre-painted steel has been developed for the manufacture of cool room (sandwich panel). The paint is specifically designed to meet the stringent quality requirements of USDA laws and regulation. "ENVATECH" Honeycomb Panel can be simply and quickly installed at low cost with the minimum of wet trade involvement and disturbance to other area. - Specially-manufactured with special aluminium honeycomb core with special non-combustible and steel color sheet facing for achieving higher fire ratings. - Increase the fire protection property. Superb for ceilings and partitions in high rise construction, area requiring the fire ratings, and specially safe rooms including computer room, electronic equipment storing rooms, lift shafts, fire-exit stair walls, etc. Honeycomb Panels widths can be manufactured to suit client specification up to 1000mm. With lengths variable to suit materials and or project requirements. Copyright 2007 @ thai envatech company limited.